After looking at several dealers and hashing back and forth whether we wanted new or used, we found a used 1998 AWD Astro that had 19,418 miles. We bought it on May 3, 1999 and so began the story of the van to be known as the “Sweet Pickle Bus”. In the fall of 1999 we also purchased our house and I knew Oswego was known for some serious snowfall so I found an ad in the paper for a personal snowplow for vans and suv's. In October I purchased a Snowbear personal snowplow and installed it on the van. After moving into our house and plowing snow for a couple of winters, I knew I wanted to see if I could find a lift kit for the van. The plow frame dragged sometimes and I needed it higher. 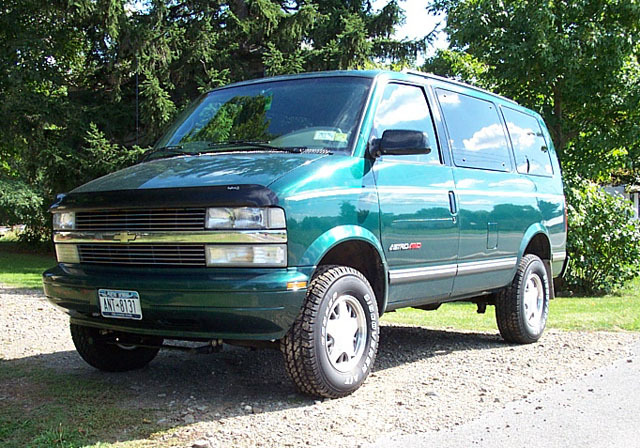 In the fall of 2001 or early spring of 2002, I found a website called Overland Vans! I KNEW then I was getting a 5” lift kit since it offered exactly what I wanted. So now the mods are starting!!! With the help of my buddy Bill, we did the 5” lift and installed a set of 30 x 9.5 R15 Tires. This was in August of 2002. Life was great for several years. I was happy plowing snow, hauling the snowmobiles, going camping and playing in the mud any chance I got. After looking for places to go wheeling, we found Paragon Adventure Park in Hazleton , PA. Our first trip was for their monthly run in May 2004. After that trip the wheeling bug was set in! As you can see, by this time, the front end had sustained some damage from an accident and I had built a custom front bumper, installed a 9,000# Milemarker hydraulic winch and a custom rear swing-out tire carrier. After the first trip I knew we needed rocker protection, a skidplate and a 2 speed transfer case. After wheeling for a few months at Paragon, I fit a set of 32 x 11.5 R15 Cooper STT's. I used air shocks to gain an extra inch of lift due to the added weight of the bumper, winch, spare parts, tools etc. Also installed were 4.11 gears and a NP231C 2 speed transfer case. Due to increased maintenance issues with wheeling and running the 32's, I decided it was time to do a Solid axle Swap. In the winter of 2004 I started gathering the parts needed for the SAS. This included buying and dismantling a 1979 F250 pickup. I used the high pinion Dana 44 axle and completely rebuilt it with a new Detroit TrueTrac posi, new 4.10 gears, all new bearings and seals as well as all new brake parts and a Parts Mike high steer kit. Once the front axle was built, I now needed a rear axle. I found a Dana 60 with 4.10's from a 1990 E250 van. The axle was located in Ohio so I asked Logan if they could haul it from Ohio to the 3 rd annual NECO in Watkins Glen. I then converted the rear axle over to disc brakes using brackets and late 70's K20 front calipers and rotors. In late July 2005, my buddy Bill, Lynne and I proceeded to do the SAS. Here is a pic of Me, Ben and Bill. At this point the SPB is sitting on both axles and 33 x 12.5 R17 Cooper S/T's and Hummer H2 wheels. We continued to wheel as much as possible and I found the SPB seemed to work pretty damn good! These next couple pics are from the first wheeling trip after the SAS. The SPB has awesome flex and the posi up front worked great! The SPB has since gotten some fresh paint on the axles. It has been herculined on the exterior. I installed a full-on hydraulic system to run the Milemarker winch as well as the plow. It also got a new rear toolbox storage compartment for holding all the spare parts, fluids and tools. This past winter I bought and installed a set of 34 x 10.5 R16LT Super Swamper LTB's. I have only wheeled it 1 time since the installation and the SPB performed flawlessly! She is currently resting peacefully in the back yard. I do take her out to play a little every once in a while.